Of the more than 2,331 confirmed planets and 4,696 planetary candidates the Kepler Mission has identified to date, only one system resembles our own with terrestrial planets near the star and giant planets set at a distance. Since the time of Copernicus, scientists have slowly moved Earth out of its originally-conceived setting as the center of the Universe. Today, scientists recognize that the Sun is an average star—not too hot, not too cold, not too bright, not too dim—situated at a random spot in a typical spiral galaxy. When Kepler began its planet-hunting mission in 2009, scientists anticipated finding planetary systems that resembled our solar system. Kepler mostly discovered planet types that our solar system lacks. With bodies like “hot Jupiters” (Jupiter-sized planets that orbit their star in only a few days) to “super-Earths” (massive rocky planets far larger than our own), exoplanet systems have a knack for surprising observers. In many alien systems discovered by Kepler space telescope, planets are huddled close to their host stars and zoom around it in just a few days. And in one system, Kepler-80, shown at the top of the page, the planets are “synchronized” in such a way that the planets align every month. These planets repeat an alignment every 27 days, returning to the same positions relative to each other. In an effort to establish how the Sun and its planets compare to the newfound systems identified by NASA’s Kepler spacecraft, a pair of astronomers suggest that our early solar system may have contained as many as four planets orbiting closer to the Sun than Venus, and that a series of cataclysmic collisions left Mercury as the last one standing. “One of the problems in our Solar System is that, by Kepler standards, Mercury is very far from the Sun,” planetary scientist Kathryn Volk, of the University of British Columbia, told Astrobiology. 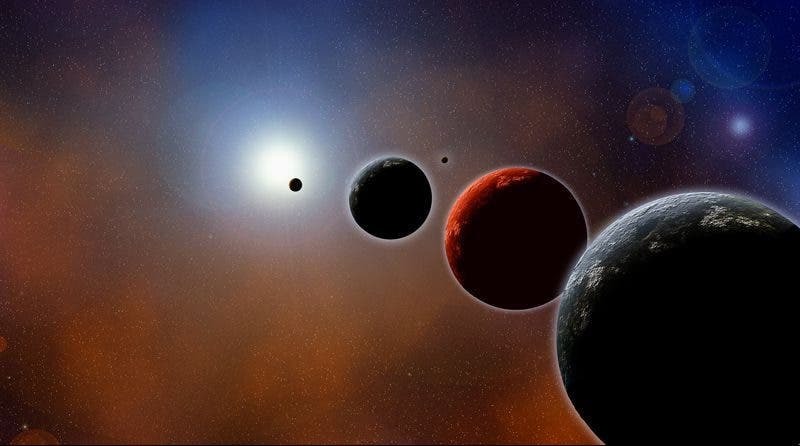 Volk and her colleague Brett Gladman, also of the University of British Columbia, propose that Systems of Tightly-packed Inner Planets (STIPs) surrounded most stars at the beginning of their lifetimes. Over time, collisions destroyed many of these planets, leaving them around only about 5 to 10 percent of the stars observed today. But although only a handful of observed systems contain STIPS, Volk thinks that they may have once dominated — and that the Sun could have been one of the STIP systems whose original inner planets were destroyed. “If STIPs readily formed, maybe they’re found around all stars, and destroyed around 90 percent of them,” Volk said. Kevin Walsh, quoted at the top of the post was not involved in the research, but applauds Volk’s work in matching the Solar System up to other planetary systems by using models to search for unseen planets it may have held in the past. Volk and Gladman realized that the small number of STIPs could provide a clue as to why our solar system seems so different. The two took 13 observed Kepler systems that contain more than four close inner planets and ran them through simulations over a 10-million-year timescale. In 10 of the targets, the small planets suffered violent collisions that changed the structure of the planetary system. According to the scientists, the remainder were likely stable for more than 10 million years. The team then ran another set of simulations over a longer period of time to explore how systems evolve as they become more unstable, and to determine how the collisions are distributed over time. They found that half the systems resulted in a second collision, but showed no sign of impending disaster beforehand. Systems with collisions remained stable for almost their entire lifetime before planets began crashing into one another. Based on their simulations, after 5 million years, approximately 5 to 10 percent of the STIPs sample would not yet have reached instability. Because STIPs are only seen around approximately 5 to 10 percent of the planetary systems observed by Kepler, this means that all could have been born with STIPs, but 90 percent of the STIP systems were destroyed by the time Kepler observed them. If this was the case, it would mean that Earth wasn’t a random outlier in the systems of planets, as it appear to be from casual observations. Instead, it would fit in and not require a special explanation as to its existence. If the Solar System—and by extrapolation Earth—is rare, it could have implications for the abundance of life in the Universe, but if it follows the same formation processes as other planetary systems, then it is no longer an quite as unusual. Mercury has long been a problem for planetary scientists. In addition to being farther from the Sun than most of the planets observed by Kepler, Mercury is dense in heavier elements and short on lighter ones. One hypothesis regarding its strange composition involves a collision that stripped the planet of its lighter crust, leaving behind a dense, iron-heavy outer layer. At the same time, Solar System models have turned up too much material to account for a single Mercury. In order to form a single planet in Mercury’s orbit, simulations require an unlikely gap—an artificial edge—in the dust surrounding the young Sun that stretches nearly halfway to Earth’s current orbit. If the gap stretched all the way to the star, as most scientists assume, the disk would contain far too much material. If most planetary systems contained STIPS when they formed, that would mean the early Solar System could have once hosted them, as well. According to Volk, this would eliminate the artificial edge to the inner disk and explain the iron-dominated planet. Collisions would also account for Mercury’s dense composition. To verify this possibility, Volk and Gladman ran simulations that added four planets the mass of the Moon and with orbits of less than half the Earth-Sun distance. These planets did not affect the formation of Venus, Earth and Mars on 500 million-year timescales, despite the collisions undergone by their rocky neighbors, a story that matches the Kepler simulations they first ran. “It is not rare to have a pair of planets go unstable and others not feel anything,” Volk said. As the small inner planets collided with one another, they suffered one of two fates. In some cases, the mass of the crashing planets may have blown off, but then consolidated into a smaller number of bodies. In the other, more destructive scenario, less than 10 percent of the initial mass survives, with the rest of it blown into small pieces that spiral into the star or into other planets. The difference often depends on how fast the planets are moving when they crash into one another; like a car wreck, faster speeds tend to result in greater devastation. While other observed Kepler STIP systems appear to have consolidated three or more larger bodies into one or two short-period planets observed today, our solar system seems to have reached the destructive end state. NASA's Kepler mission scientists discovered a planetary system that is home to the smallest planet yet found around a star similar to our sun. The planets are located in a system called Kepler-37, about 210 light-years from Earth in the constellation Lyra. The smallest planet, Kepler-37b, is slightly larger than our moon, measuring about one-third the size of Earth. It is smaller than Mercury, which made its detection a challenge. 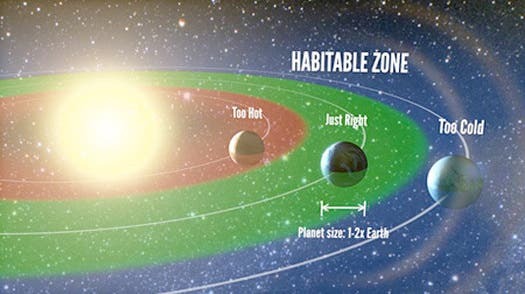 The moon-size planet and its two companion planets were found by scientists with NASA's Kepler mission to find Earth-sized planets in or near the "habitable zone." However, while the star in Kepler-37 may be similar to our sun, the system appears quite unlike the solar system in which we live. Astronomers think Kepler-37b does not have an atmosphere and cannot support life as we know it. The tiny planet almost certainly is rocky in composition. Kepler-37c, the closer neighboring planet, is slightly smaller than Venus, measuring almost three-quarters the size of Earth. Kepler-37d, the farther planet, is twice the size of Earth. The first exoplanets found to orbit a normal star were giants. As technologies have advanced, smaller and smaller planets have been found, and Kepler has shown even Earth-size exoplanets are common. Kepler Space Telescope Hits 1,000 Planet Milestone –"We're Closer than We've Ever Been to Finding Earth Twins"